RICHMOND, VA: ClearPoint Financial Solutions, which offers credit and other financial counseling, has launched a social network for those dealing with financial issues. 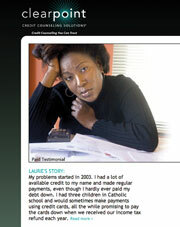 The goal is to lessen the stigma associated with debt. Repaydebt.org provides a forum for consumers to comment about their own experiences with debt or help others resolve issues. The site's primary message is to encourage consumers to seek help as soon as possible, in addition to helping them feel less isolated. It will broadly target all those facing debt problems, but especially those in the early stages of debt. Allie Vered, director of education and public awareness, said the company developed the campaign from an internal survey it conducted with current clients. “We wanted to identify emotional triggers people would relate to [regarding] their debt,” she noted. ClearPoint plans to promote the social network by targeting general consumer media, business reporters at regional papers, local and national TV news, and radio stations. The nonprofit, which also offers paid services, has launched a nationwide campaign on public transit to help promote the site. ClearPoint is also using SEO to improve the site's visibility when people search for the word “debt” online. McClary pointed out that the biggest challenge facing the campaign is raising awareness about the site, but its limited funds meant that hiring a PR firm was not an option.